I’ve been using Olay products for a couple of years now and figured I should step up my game and use more anti-aging products now that I’m in my 30s. 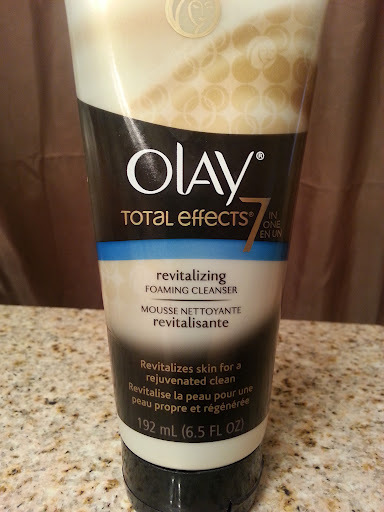 Olay Total Effects is my new favorite face wash, it’s a foaming cleanser that smells fantastic and fights 7 signs of aging. 3. Fine line appearance reduction. I can honestly say, my skin feels super fresh and my skin just seems to have a little glow and brightness to it. This cleanser is also really good at removing most of my makeup, It removes my mascara completely but sometimes I still have a faint ring of eye-liner on my bottom lashes. If your skin is dull or dry, I recommend this cleanser. I plan on switching to the Total Effects creams as well once my current ones run out.